Hello I’m Philippe Waechter, chief economist at Natixis Asset Management in Paris. It’s my first periscope so be indulgent. I wanted to comment on the IMF economic outlook and specifically on the third chapter of the publication. In this chapter, the IMF clearly said that the 2008 crisis has had a strong and persistent effect. There will be no convergence to the pre-crisis trend. The current one is below the pre-crisis trend and will remain below it. Moreover the GDP potential growth rate will be lower than before the crisis. This means that there will be a divergence between the pre-crisis trend and the current one. The IMF is trying to understand if the economy will be able to go back to its “pre-crisis” normal framework or if we have to think on a new normal framework. That’s the only pertinent question. Economists have already started to think about a new normal framework. Larry Summers in November 2013 at an IMF event spoke of Secular Stagnation. It is the idea that due to an excess of saving, growth would be low for an extended period. More recently Alice Rivlin from the Brookings Institution gave a speech on the impact of a long term 0 inflation rate. In others words, academics start thinking of a world where growth trend would be low and the inflation rate close to 0. The IMF publication is in the same mood. In developed countries, the Institute said that ageing people and the lack of investment will create conditions for a lower growth rate. Aging population reduces the labor force and too low investment is a drag for productivity improvement. For emerging countries, the question is not so different. There is still an aging population but also a change in the growth process which means lower investment rate. In many emerging countries, higher incomes have led to a stronger consumption momentum. And the economic model is now rebalancing to higher consumption and lower investment. At the same time, the productivity gap between developed and emerging countries has been reduced and the catch up effect is not as strong as it used to be. The expected growth trend for developed countries is +1.6% per year from 2015 to 2020. It was 2.25% before the crisis. For emerging countries the expected growth rate is 5.2% versus 6.5%. The second is that we will have to think differently to reduce imbalances. Usually we thought that a strong growth period will close most macroeconomic imbalances. May be this will be different. There is no determinism in this framework and probably the world tomorrow will behave differently with robots. The world is changing very rapidly and winners will be countries that will be able to adapt to a new and volatile framework. Periscope is Apps available under IOS for the moment. It’s a live video during which the attendance can ask questions or make remarks. It is not the case yet on this video but for the next a lot of improvement will be added. The first point to be mentioned is the lower momentum on US employment. 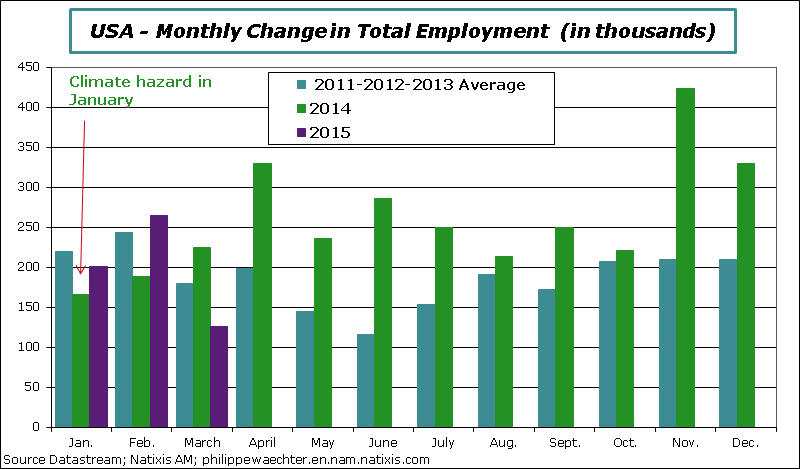 In March, the number of new jobs was low at 126 000 versus 264 000 in February. January and February figures have been revised downward by -69 000. In a recent past, revisions were on the upside. During the first quarter, less than 200 000 jobs were created each month on average (197 000 exactly) versus 324 000 for each month on average during the last quarter of 2014. The biggest change can be seen in “professional and Business Services” where the number of new jobs has been divided by a factor 2 between the last quarter of 2014 and the first of this year. In the manufacturing sector, 29 000 new jobs were created on average in the last three months of 2014. The number was just 6 000 on average for the first quarter.